How to power two motor drivers and Raspberry Pi with one LiPo battery? apologies in advance for the lengthy question. I'm working on creating a remote controlled rover. It is controlled by a raspberry pi, and driven by two MDD10A REV2.0 motor drivers (one for the left two wheels and one for the right two wheels), which themselves are sent control signals from the Pi. I was wondering how i would power both of these motor drivers with one battery. I would like to use the 25C-11.1V 2200 mAh LiPo battery that I have, but I only have a degree in computer science so my hardware knowledge is pretty limited. 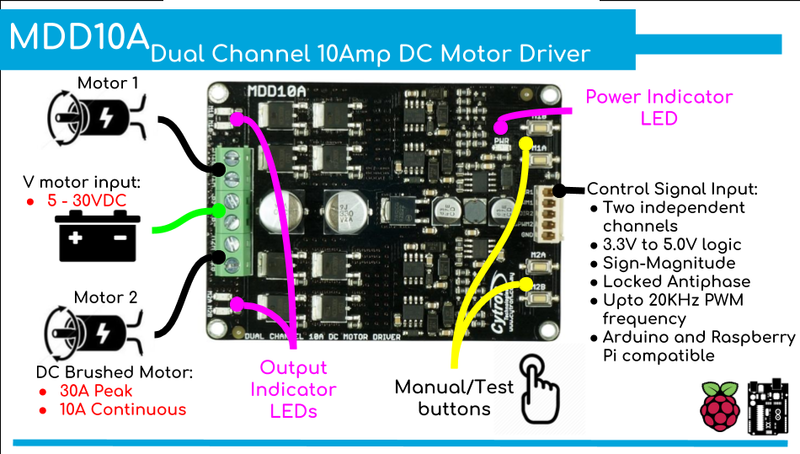 Currently I can power one motor driver (2 wheels) with it, but I'm not sure what hardware I need to achieve this. Furthermore, eventually we want to add the PiCam 360 module, a Particle board for LTE connection, and a DWM1000 module for ranging data, all controlled by the Pi. I was planning to first power the Pi with a USB power bank, and the motors with the LiPo, but what would I need to do to power all of this with one battery? A raspberry pi needs 5V. You can hook the motor controller directly to the battery. You'll need a DC to DC 5V step down converter for the rasberry pi to make sure it get's 5V. I'd imagine that most other stuff would run on 5V. Some things run on 12V, if they do get a 12V DC to DC step up module. If have a power supply, make sure the voltage is the same for the power supply as it is for the load (raspi). The second thing to check is to make sure the power supply can source more current than the load can use, otherwise the voltage will drop and you'll have a brownout. Not the answer you're looking for? Browse other questions tagged batteries motor raspberry-pi battery-operated remote-control or ask your own question. What battery to choose with motors?